Chuck here from PowerAddicts-YouTube and FixJeeps.com the website. 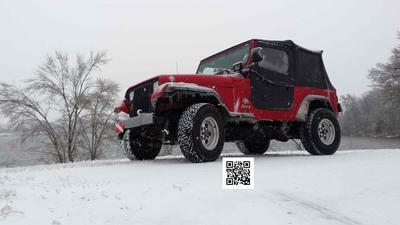 I use my 1991 Jeep Wrangler as the center of the mods and fixes I present on the site and YouTube channel. As I mentioned in the title, I have named her Beth. Why Beth? Good question. Kinda simple answer. All you movie buffs, think back to the original Frankenstein movie. Old Frankie was piece parted to create the movie character we all grew to know. Well, Frankie needed a sweetheart because he was lonely. Enter "Bride of Frankenstein", she was created much the same way as Frankie. Some people don't remember the "Bride" has a name. Her name is Elizabeth. I then shortened it to Beth. Beth (the Jeep) has a mix of different parts that make up what she is. There are obviously original Jeep parts. But, there are Dodge Durango parts, Chevy parts and Ford truck parts as well. I'll create a mod list below of the mods that I have done. I'm sure there is more, just cant think of it at the moment. Join in and write your own page! It's easy to do. How? Simply click here to return to Show my Jeep.